This big fluffy long-haired orange tabby cat is available for adoption at the Humane Society of Noble County. Due to some confusion, he has two names - Prince Harry and Big Red - take your pick! He is a neutered male who is front declawed and up-to-date on vaccinations. He is approximately 4-7 years old and has been at the shelter for about a week. 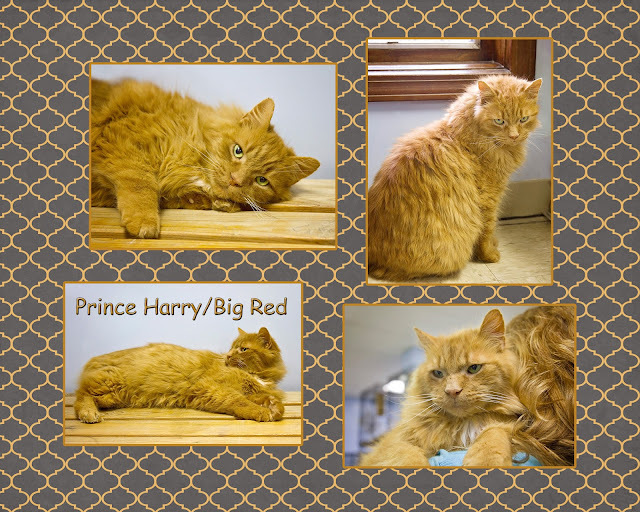 Prince Harry/Big Red is an extremely friendly, cuddly, laid back cat. He loves to be petted and brushed, and he will make himself right at home on any chair, couch, counter, bench (as in the pictures), or lap. If you have the time to give a cat a lot of attention and receive a lot of love in return, Prince Harry/Big Red is the cat for you! Come visit him at the shelter and be prepared to fall in love! This is Banjo, a short-haired male who is white with a black tail and a couple of black patches on his head and side. He is available for adoption at the Humane Society of Noble County and is up-to-date on vaccinations. Banjo is approximately a year old and has been at the shelter for around 3 weeks. He is a very friendly boy who likes human attention, likes toys, and is getting used to being around other cats. In the pictures, you can see him playing with one of his favorite toys. And look at his beautiful gold eyes! Please come to the shelter to visit Banjo and the other fabulous cats and dogs who are waiting for their forever homes! One is bound to melt your heart! 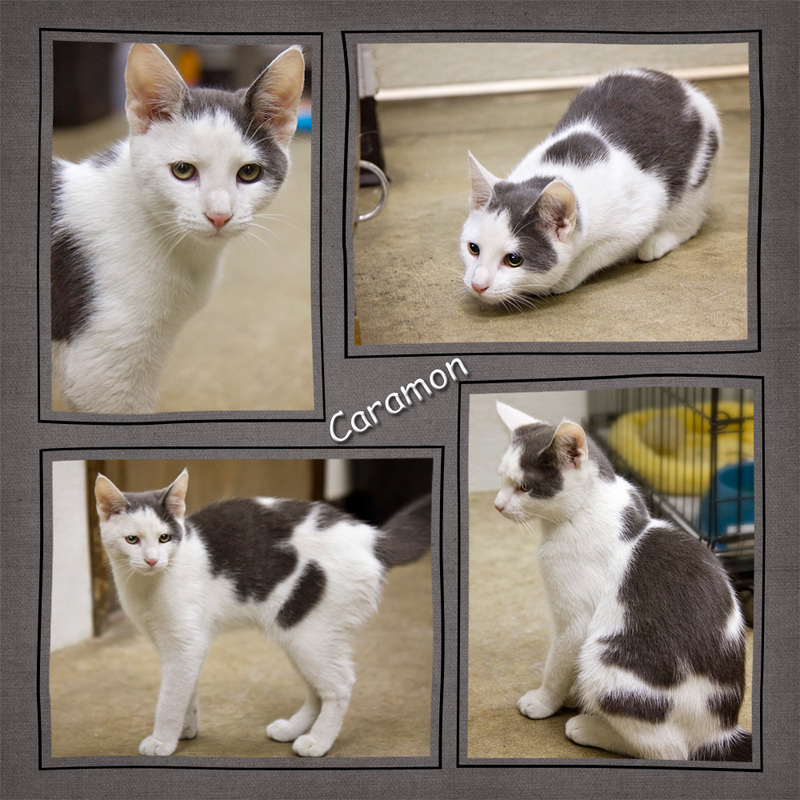 This cute boy is Caramon, a short-haired white cat with gray patches, who is available for adoption at the Humane Society of Noble County. He is 6-7 months old and has been at the shelter for a little over a week. He is up-to-date on vaccinations. Caramon is curious and playful. He has adjusted quickly to the other cats and loves to run and jump with them. In the top right picture, you can see him in pounce mode as he gets ready to jump at one of his friends. He also likes human attention and is learning to play gently with human hands. Come visit him at the shelter and see if you could give him his forever home! 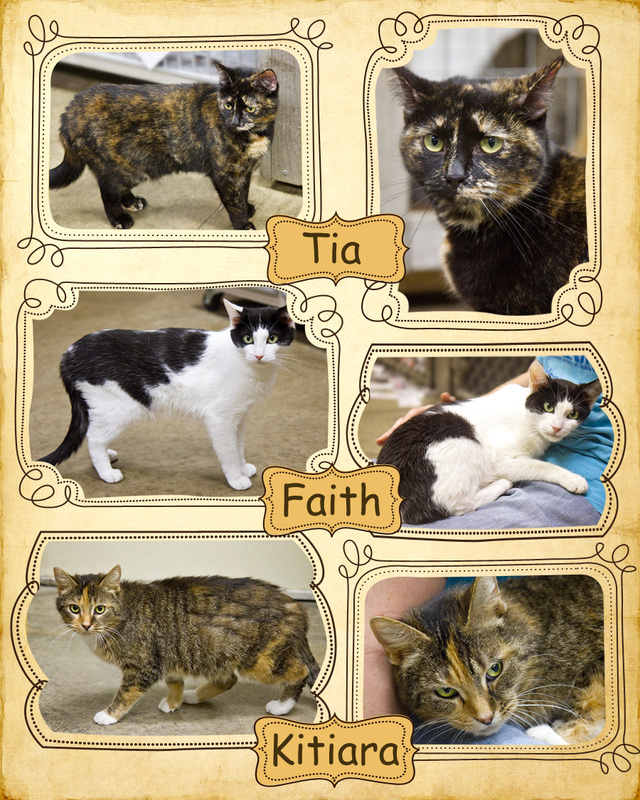 Tia and Faith are long-time residents of the Humane Society of Noble County, and Kitiara is a new resident. All are available for adoption and all are up-to-date on vaccinations. Tia is a short-haired torti female who is about 4 years old. She has been spayed and is FIV-negative. She is the 2nd-longest resident at the shelter, having been there since November of 2013. I really don't understand why she hasn't been adopted because she is friendly, gets along with other cats, and although she can be a little independent, she loves attention. I also think she has such a cute, unique look because her markings make it look like she has cream-colored eyebrows, and she has such an interesting expression on her face! Faith is a short-haired black and white female with beautiful green eyes who is approximately 2 years old. She is FIV-negative. She has been at the shelter since June of 2014. Although she is a little shy at first, Faith really warms up to you when she gets to sit on your lap - one of her favorite things as you can see from the pictures. She loves to be combed, brushed, and petted, and is gradually becoming more confident around people. She needs a family which can spend a lot of quality time with her. Kitiara is a short-haired calico/tabby mix female who is 1-2 years old and is front-declawed. She is the newcomer - she has only been at the shelter for about a week. Right now she is a little shy and overwhelmed by her surroundings and all the other cats, but she is gaining confidence. She likes to be held and cuddled, as the pictures show. She, too, needs a family that could give her a lot of gentle love and attention. 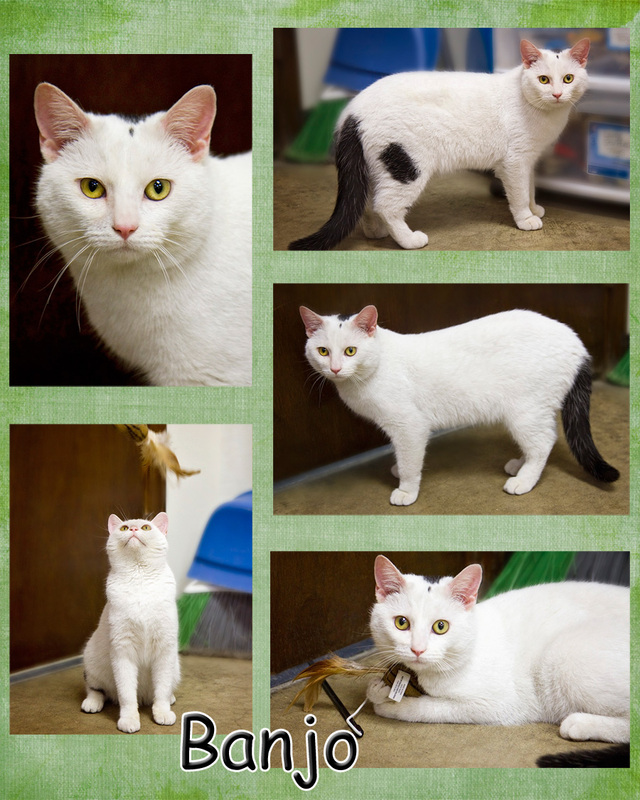 Come visit these beautiful cats and see if you could give one or more of them a forever home! Say hello to these look-alike brothers, Toby and Caleb, who are available for adoption at the Humane Society of Noble County. They are short-haired black, silver, and tan tabbies who are 5-6 months old. They have been at the shelter for about a week. Both are up-to-date on vaccinations. Toby has darker hair on his tail tip and along his spine, and he is a little thinner than Caleb. Caleb is a little bigger than Toby and has a slightly tanner face. But if you don't look at them closely, it is very difficult to tell them apart. Both of these boys are very friendly and playful. They love toys and they like to explore. They also love attention and will purr loudly when petted. They also stick their paws through their cages trying to get you to give them a little love. Caleb will even talk to you to get your attention! Please come to the shelter to meet these guys and see if you could give them a forever home! These beauties are Dallas and Talia who are available for adoption from the Humane Society of Noble County. They are both up-to-date on vaccinations and are FIV-negative. Both are around a year old and have been at the shelter since March, 2015. Talia is a female short-haired black and tan tabby with some orange patches. She is independent, but also very loving. She likes to play and explore, and is good with other cats. She especially likes to be held over your shoulder, as you can see from one of the pictures. These wonderful girls have been passed over for too long. They are very deserving of a loving, forever home. Please come to the shelter to visit them! 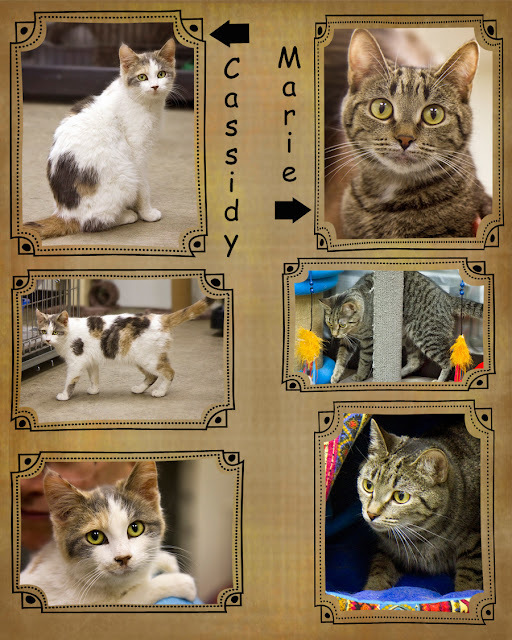 These two pretty girls are Cassidy and Marie. Both are available for adoption at the Humane Shelter of Noble County. They are up-to-date on vaccinations. Cassidy is a short-haired muted calico female who is 6-7 months old. She has only been at the shelter for about a week. She is a little reserved, but is very sweet and cuddly. She loves to be combed and brushed, loves to sit in your lap and be petted, and she purrs loudly to express her pleasure. Marie is a short-haired black, silver, and tan tabby female who is a little less than 2 years old. She has been at the shelter for almost 18 months, which I don't understand because she is such a nice, beautiful girl. She is energetic and playful, likes all toys, as you can see from one of the pictures. She is good with other cats, and although she is independent, she also loves attention. She has also tested FIV-negative. Please come to the shelter and consider giving these cats or any of the other wonderful animals a forever home. You will not be sorry! Here are 3 boys who sort of look alike and are available for adoption at the Humane Society of Noble County. They are all up-to-date on vaccinations are are FIV-negative. 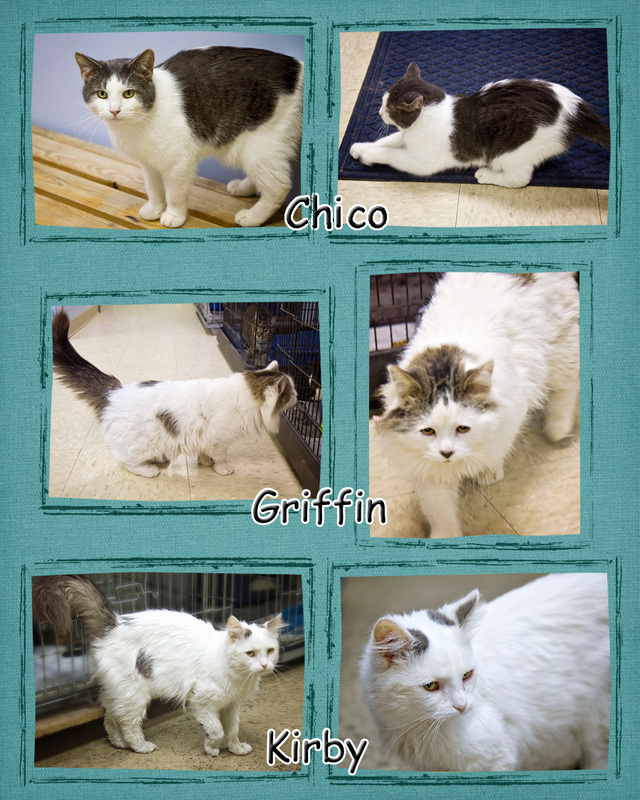 Chico is a medium-haired white male with black and gray tabby markings. He is neutered and is around 2 years old. He has been at the shelter for almost a year. Chico is a curious and loving cat and wants a forever home where he can get lots of attention! Griffin is a long-haired male who is white with a few grayish tabby spots, a gray tail, and a huge mane! He is approximately 1-3 years old and has been at the shelter for a couple of weeks. This fur ball likes to explore and receive attention. Kirby is a long-haired white male with some gray spots and a gray tail. He is 3-4 years old and has been at the shelter for a couple of weeks. He is also an explorer and he loves to be petted and brushed. These boys are all nice, friendly cats and deserve forever homes. Please come visit them at the shelter!